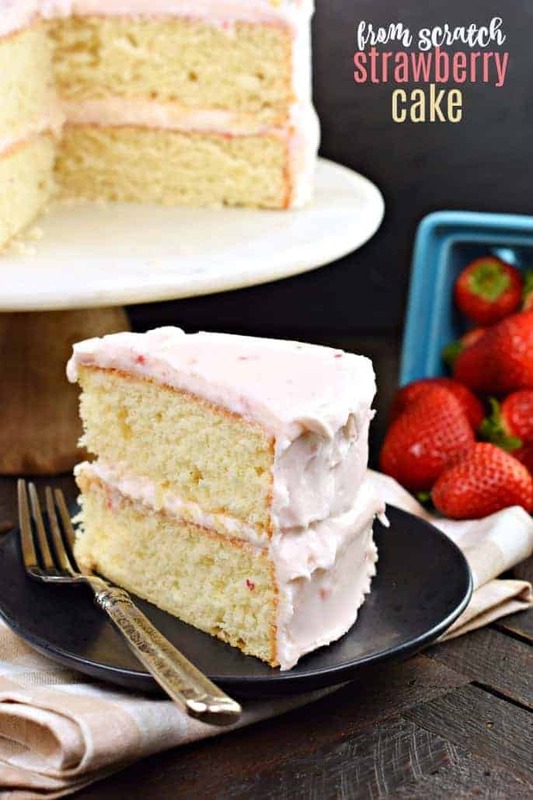 This delicious, from scratch, Strawberry Layer Cake has a scrumptious buttercream frosting made with Promised Land Dairy Very Berry Strawberry Milk and fresh strawberries! One bite and you’ll never make a boxed cake ever again! 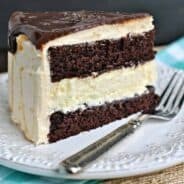 I’m always on a quest to make delicious layer cakes, from scratch. 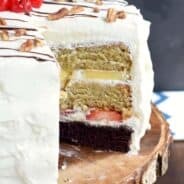 I mean, sure it’s easy to purchase a boxed mix in a pinch, and some cans of frosting….but there is a feeling of accomplishment when you create a decadent cake all on your own with fresh ingredients. One of the ingredients that has become a staple in my kitchen is Promised Land Dairy milk. It’s the richest, creamiest tasting milk my family has ever tried. No exaggeration! You’ll remember last month I made this Chocolate Cobbler recipe featuring the Midnight Chocolate milk. So decadent! Today’s Strawberry Layer Cake uses Promised Land Dairy Very Berry Strawberry Milk. It’s creamy and fresh tasting with no artificial flavors, colors, hormones or antibiotics! You’ll love that when you pour a glass of this fresh Jersey cow milk, you won’t see bright, fake colors. Just a creamy, rich milk packed with fruity flavor from fresh strawberries! My kids didn’t believe it was strawberry milk until they took a sip. Now it’s all they request. And since Promised Land Dairy is great quality and high in protein and calcium, I can’t turn them down! Making a great tasting cake comes from good quality ingredients, and following the directions, haha! Here are a few tips to making this layer cake PERFECT on the first try! First start by taking your eggs and butter and allowing them to come to room temperature. While this is NOT mandatory, your cake will still turn out if your eggs are chilled, you WILL get a finer crumb and more even texture by allowing them to come to room temperature! Just do it. When making a layer cake I rely on using bake even strips on my cake pans. These help your cake rise evenly so when it’s done baking it won’t have a dome on top that needs to be sliced off. If you don’t own bake even strips, you can make your own by cutting a kitchen towel lengthwise in wide strips. Then soak them in water and pin them around the sides of your cake pans. If you purchase the bake even strips the directions are on the package. I use these regularly and LOVE them! Be generous in greasing your cake pans. If you have a set of cake pans that tend to be “sticky”, grease them (with shortening and flour or baking spray) and line the bottoms ONLY with a circle of parchment paper. This guarantees a beautiful release EVERY time. There’s nothing more disappointing when baking than having a cake stick to the pan! When using fresh berries in frosting, these will add extra moisture. For today’s frosting I only added TWO small strawberries. That was enough to add a hint of color and texture. The Promised Land Dairy Very Berry Strawberry milk does not have artificial color, so I wanted to keep it fresh and simple by not adding in food coloring. The key to this frosting is after you make it, refrigerate it for about an hour before frosting your cakes. I usually make my frosting FIRST, then refrigerate it, then bake and cool my cakes, then frost them. Today’s cake needs to be kept refrigerated (COVERED FOR FRESHNESS). When ready to serve your cake, remove it from the refrigerator about 30 minutes in advance for best flavor and texture! ENJOY! 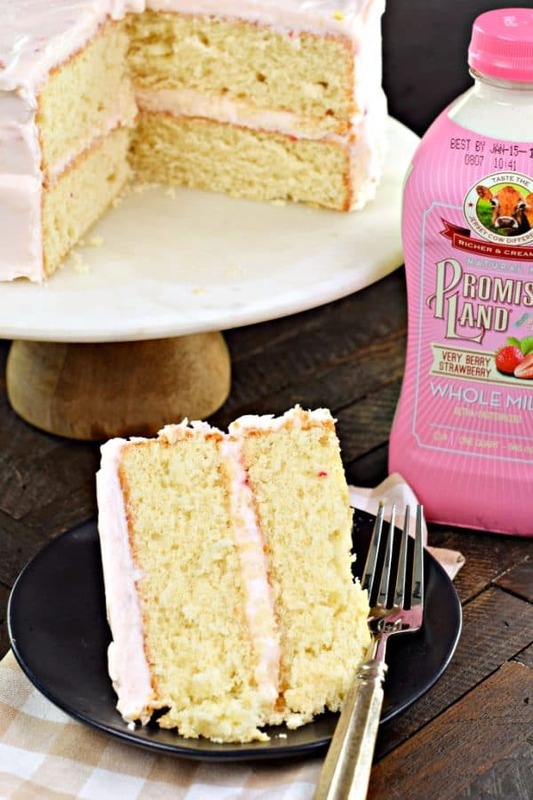 What will YOU make with Promised Land Dairy Very Berry Strawberry Milk? I’m thinking a tres leches cake is going to happen in my kitchen very (berry) soon! You can also whip up a batch of these Strawberry Cheesecake Milkshakes for dessert tonight! Check out some of the other #farfromordinarymilk recipes on pinterest! Connect with Shugary Sweets! Be sure to follow me on my social media, so you never miss a post! 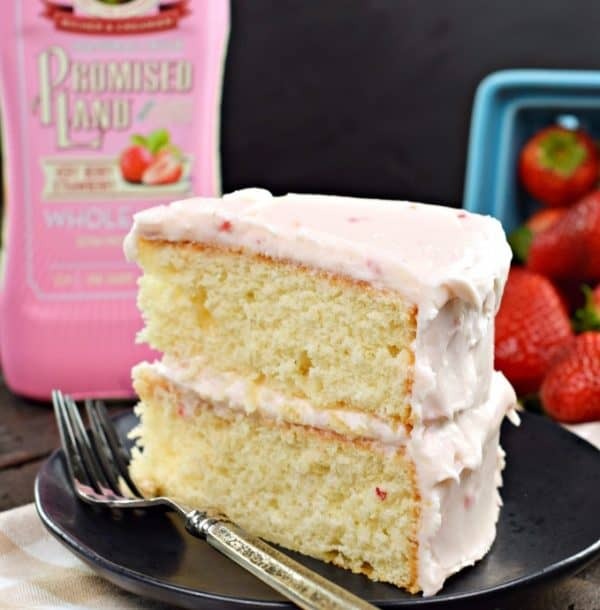 This delicious, from scratch, Strawberry Layer Cake has a scrumptious buttercream frosting made with Promised Land Dairy Very Berry Strawberry Milk and fresh strawberries! One bite and you'll never make a boxed cake ever again! Spray two 9-inch cake pans with baking spray, or grease generously with shortening and flour. Wrap bake even strips around the sides of the cake pans. Set aside. Whisk together the egg whites and 1/4 cup of the Very Berry Strawberry milk in a small bowl until slightly combined. Set aside. In a mixing bowl, beat butter, sugar, and vanilla extract for 2 minutes on medium speed, scraping down the sides of the bowl as needed. Add in dry ingredients and mix until combined. Beat in egg white mixture until fully blended. Add in remaining milk and beat for 3-4 minutes, scraping down the sides of the bowl. Pour batter into pans and bake in a 350 degree oven for 26-28 minutes. Remove from oven and cool about 10 minutes in pan. Then remove from pans and cool completely on wire rack. Beat butter and cream cheese for 3 minutes using whisk attachment on an electric mixer. Add in fresh strawberries and beat until blended. Add in powdered sugar and Very Berry Strawberry milk. Beat an additional 4-5 minutes, scraping down the sides of the bowl as needed. Refrigerate frosting for about 60 minutes (I usually make the frosting before the cake). To assemble, place one layer of cake on a cake stand. Add a large amount of frosting to top and smooth with an offset spatula. Top with second layer of cake. Apply frosting to entire cake. ENJOY. Store frosted cake in refrigerator for best results. When ready to serve, remove for about 30 minutes before serving. Discover your new "signature" desserts! SO many things I love about this…first that it’s unexpected, strawberry in December, but I love that because it’s such a nice change from the red and green! 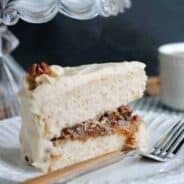 The crumb and texture look perfect, the frosting too, and it’s a scratch cake with GREAT tips about cake making in general! Can I use gluten free flour equally for cake flour ? I’m not sure as I haven’t tested that! I can’t wait to try this cake!! :) what can I substitute for the very berry strawberry milk? I am in Arizona and I just tried to find thru the milks website and there isn’t any within 25 miles of me. Sooo I would love a suggestion on what to substitute for this. Oh bummer! You can make your own strawberry milk (using whole milk and powder or syrup), or just use whole milk and the fresh berries. Aw that’s so awesome to hear, thank you! 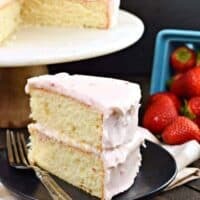 This strawberry cake is delicious! Super easy to make and it was a hit! Um WOW! I love a white cake base and with strawberry milk? YUM! We order a fresh strawberry cake from a local bakery yearly for my husbands birthday, I think I’ll try making this! Oh my goodness! This looks amazing!! I’m happy to eat strawberry any time of year!! especially when it’s paired with vanilla!! This cake is so fluffy and delicious! Craving a slice right now! 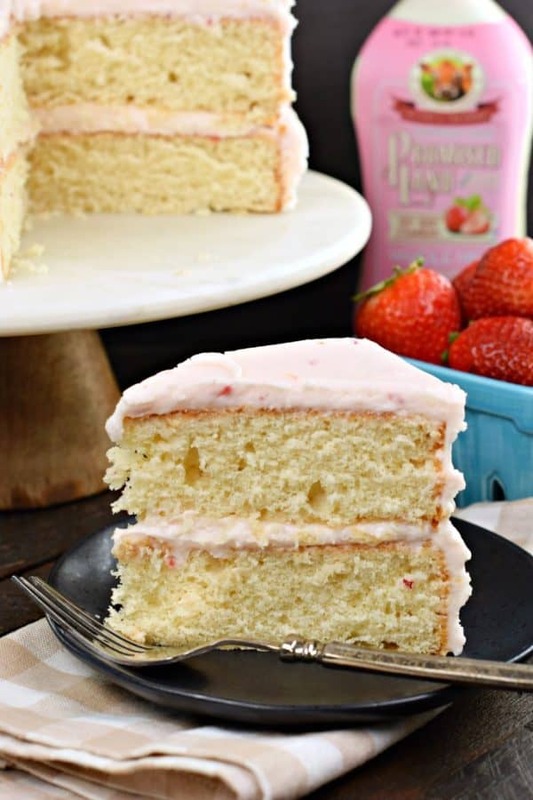 You had me at buttercream frosting and strawberries! I’m not a huge fan of chocolate cakes, so this is a great alternative – I’m definitely going to try it out! ©2019 Shugary Sweets All Rights Reserved. Design by Purr.